Morro Bay is a charming seaside town with a bustling waterfront, charming old town, and an enormous landmark in the form of Morro Rock which sits in the harbor. You’ll likely first notice this large iconic rock from miles away as your approach the city. Morro Bay sits along the Central California Coastline just off of California’s scenic Highway 1, located midway between Los Angeles and San Francisco. While perhaps best known for its waterfront activities, outdoor adventure opportunities, and rock landmark, Morro Bay also sports a downtown shopping district in its Old Town, and this was the reason for our first visit to this little charming town. The town sports dozens of antique malls, thrift stores, gift shops, and local speciality stores that beg to be explored. 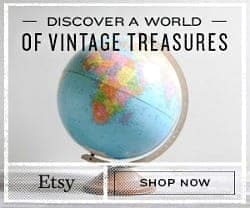 What would you do if you were given $500 to spend to buy gifts for a “recycled holiday”, where instead of buying a bunch of shiny and new things online and from crowded department stores, you buy vintage, antique, and secondhand items for those on your gift list? We were invited by the Morro Bay Tourism Board to do just this! Ethan and I were very excited to participate as we both really liked the idea of being able to gift items in a manner that supports locally sustainable and environmentally friendly practices. We’ll tell you all you need to know to start planning your visit to Morro Bay, provide a list of local stores you may want to consider visiting, and tell you about our own recycled holiday shopping adventure. 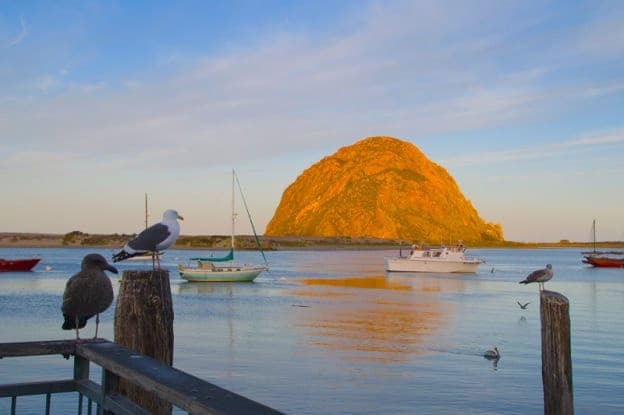 Driving is the easiest way to get to Morro Bay, which is located in San Luis Obispo County along California’s Central Coast, halfway between Los Angeles and San Francisco. The town is located off Highway 1, near the intersection of Highway 1 and Highway 41. The nearest airport is located in San Luis Obispo. You can explore places in downtown Morro Bay on foot, but other places will require a car or bus. Morro Bay Transit runs hourly bus service throughout the city (check hours), and in the summer a free trolley shuttle runs the length of the Embarcadero (the main street along the waterfront) on certain days. 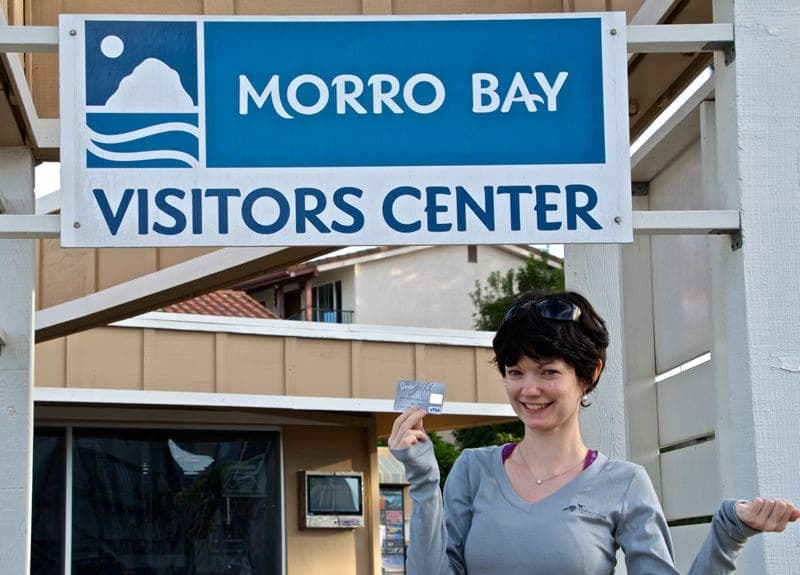 To find out more transportation information, you can contact the Morro Bay Visitor Center by phone (805-225-1633), in person (255 Morro Bay Boulevard, Morro Bay, CA 93442), or online. There are a large number of vintage and specialty stores in Morro Bay, more than you would imagine in a town of only 10,000 people. Here is a list of the nine very varied shops we personally visited during our holiday shopping day in Morro Bay. Two of these (Main Street Antiques and Highway 41 Antique Emporium) require driving, but the rest are all near one another and can be reached on foot from the center of town. If you are looking for an easy browsing experience, head to Morro Bay Boulevard, park your car, and wander up and down the street. You’ll walk past a number of vintage, antique, and other speciality stores as well as some great local coffee and lunch spots. 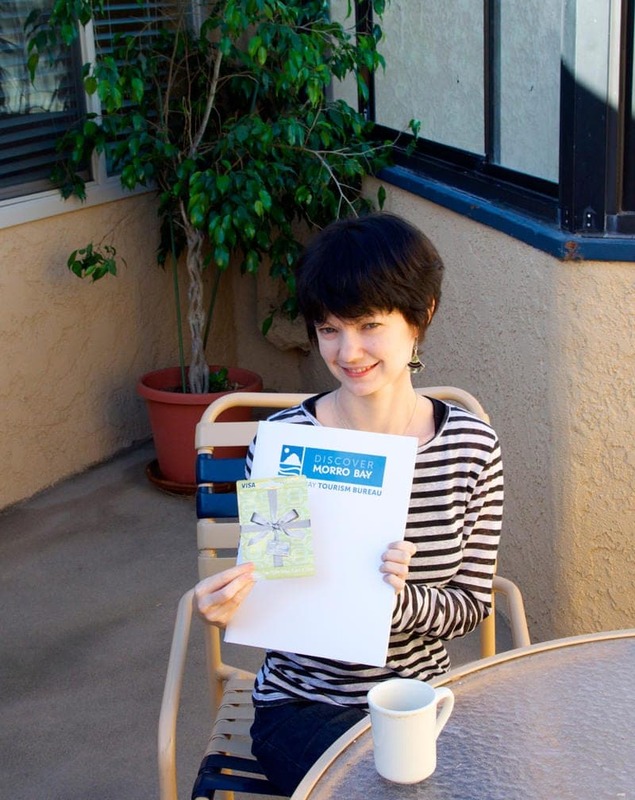 Want to check out even more shopping opportunities in Morro Bay? 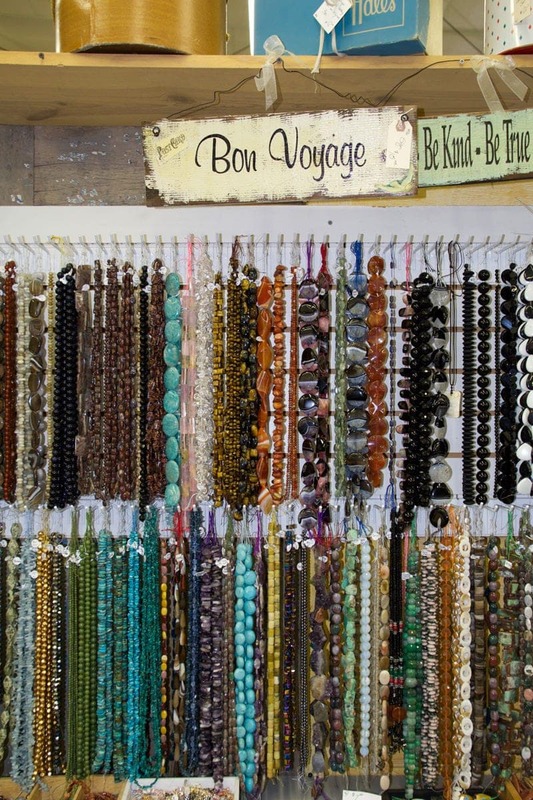 Check out this more comprehensive store list by the tourism board that includes a number of vintage shops, antique malls, thrift shops, and speciality stores in Morro Bay. You’ll need to make a lot of fuel and rest stops if you are planning a shopping holiday in Morro Bay. Luckily you’ll naturally come across a number of coffee and lunch stops as you engage in your shopping adventure. 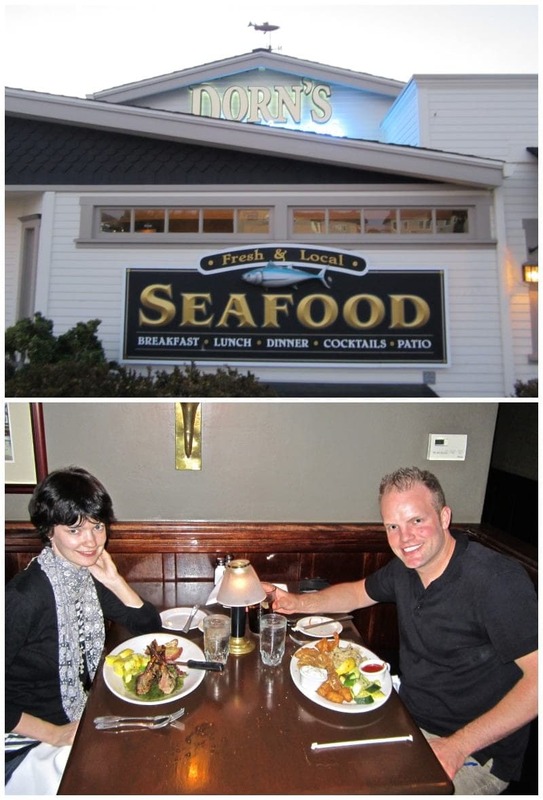 There are also a lot of options for dinner, with seafood being a must-try in this harborside town and local oyster and abalone farms are located nearby. Morro Bay and the surrounding area is also known for its wine bars and craft breweries so those are also fun to check out. We tried and would recommend Shine Cafe (415 Morro Bay Blvd) for lunch and Dorn’s Original Breakers Cafe (801 Market Street) for any meal. You can read more about our dining experiences below. 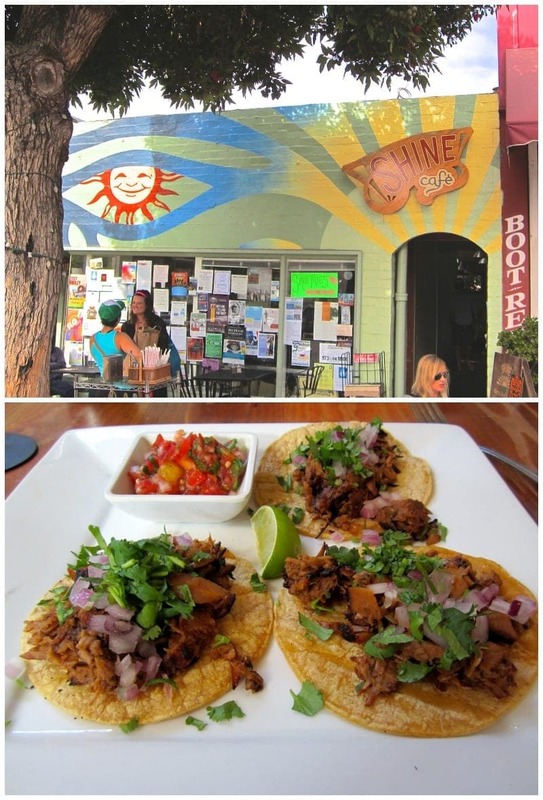 For more dining options, check out this list of dining options in Morro Bay. To fully experience Morro Bay, you should consider spending a night or two as there are a number of activities to keep you busy for at least a few days. There are a variety of lodging options, including bed-and-breakfasts, inns, motels, vacation rentals, camping and RV sites, and business hotels. 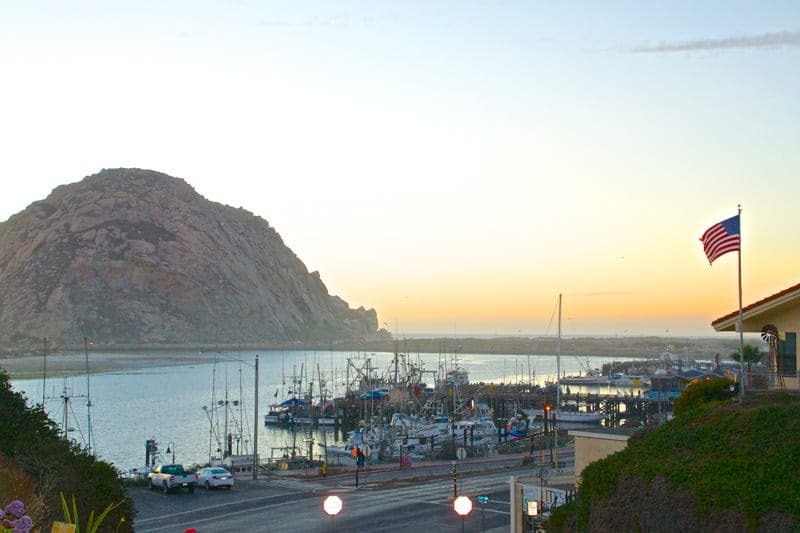 Check out a list of lodging options in Morro Bay. 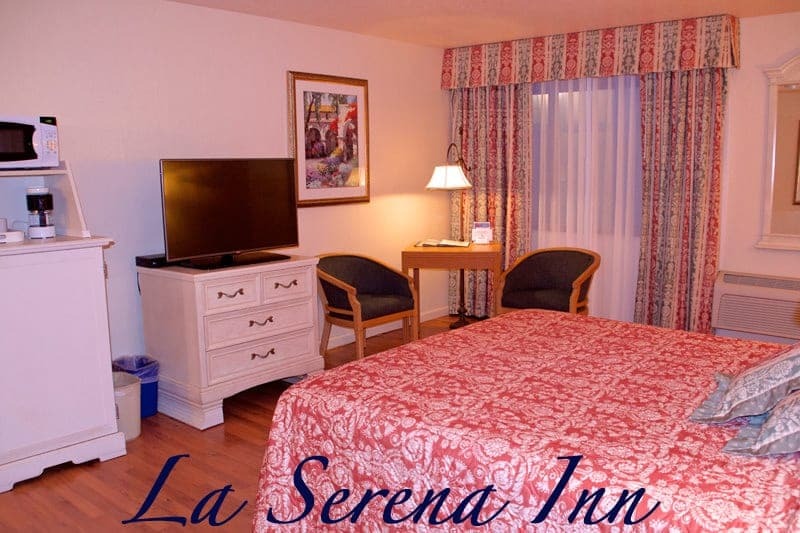 We spent two nights at budget-friendly and comfortable La Serena Inn, which is located within walking distance of the harbor. We arrived in Morro Bay the night before our shopping adventure and had a bit of time to observe sunset in the harbor. We got up early the next morning to have breakfast at our hotel, La Serena Inn, and then drove to our first stop at Highway 41 Antique Emporium. We spent quite a long time in this place as its large and has a very varied inventory, finally purchasing a 1980’s British Airways Concorde travel wallet for me and a green scarf as a gift for Ethan’s grandmother. Next was Main Street Antiques (browsed but no purchases) and then Summer Cottage (two gift purchases), and then we parked the car to visit all the shops clustered on Morro Bay Boulevard which are all within walking distance. The morning continued with four more stops at antique and thrift stores (Revolve, Threads, Castaways, Treasures Antique Mall) and several more gift purchases. After a long morning of shopping we were tired, hungry, and needed a place to rest our feet. We had walked past Shine Cafe earlier in the morning, which is a popular vegan spot featuring fresh and organic ingredients, and noted how busy it was with the locals. I asked Ethan if he wanted to go there and he reluctantly agreed as the word “vegan” was a bit of a turn-off as neither of us tend to eat a lot of vegetarian or vegan meals. However, I would definitely recommend this place even for those who would normally avoid a vegan restaurant. I had the Famous Tempeh Taco and Ethan had a plate of the three jackfruit “carnitas” street tacos, the street tacos were particularly delicious and I have no idea how they get jackfruit to taste like meat! We also realized over lunch that we had not yet spent even $200 on our gift card! 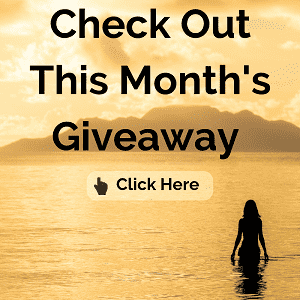 Through this experience, Ethan and I discovered how thrifty we had become over the years and how difficult it is for us to spend money on nonessential items—even when it was not our money! Although we had made a number of purchases, we had primarily selected lower priced items with most items priced under $30. Part of our agreement with the tourism board was that the money needed to be spent at local businesses in Morro Bay so we had to spend the entire amount. We only had two stores left on our list so decided to try to make some larger purchases. However, this plan was thwarted as one of the stops was a thrift store that does not take credit cards (Fabulous Finds) and a record store (Vinyl Isle). Other than an Elvis puzzle for my dad at Vinyl Isle, we made no purchases and we were nowhere close to having spent enough money. So we decided to backtrack with Ethan going back to Revolve to buy a Kenneth Cole black jacket he had been eyeing earlier in the morning but had forsaken as we were primarily concentrating on gifts. I meanwhile strolled a street market that had sprung up on a street off of Main Street, selling fresh produce, local products, photographs, and crafts. We then made the decision to return back to Highway 41 Antique Emporium as it was the largest and most varied of our stops. One great thing about returning here was that later in the day there is regularly an option to do wine tasting outside. Customers can stroll the store with a glass of wine in hand so I of course took advantage of this opportunity! Over the next two hours, we continued to select so many gifts for our family and friends and a few items for ourselves. Although there were so many unique items and quality merchandise, we still struggled to spend the rest of the money given our thrifty natures. At one point when at the register we had to tell the staff member that this would not work, and she clearly was disappointed thinking we had overspent but then was elated (and shocked!) when we said we needed to buy another $89.00 worth of merchandise. So we started browsing the jewelry cases and I was able to get 4 pairs of earrings and Ethan grabbed two sets of magnets to take care of the final $89.00. Mission accomplished! A tough job but someone had to do it, haha! After all that shopping, we returned back to our hotel for a bit of a rest before heading out to a nice relaxing dinner at Dorn’s Original Breakers Cafe. This popular restaurant has been serving food since 1942 and is a favorite of both locals and tourists and is located right on the harbor with great views. Then it was an early bedtime as we found out that shopping all day is very tiring! In the end we had a fun time shopping, eating, seeing various parts of Morro Bay and chatting with a number of local business owners and fellow shoppers. We spent exactly $499.14 and over the course of the day purchased such a large number of items. Among our purchases were several scarves, a jacket, a decorative drink tray, a tea strainer, a travel wallet, several books, coffee mugs, decorative book ends, three sets of cloth napkins, letter holders, wine glasses, a map, a compass, a bracelet, several pairs of earrings, magnets, an unopened jigsaw puzzle, a Swiss Army knife, a rug, place settings, and a set of glass jars. We really enjoyed our visit to Morro Bay and would love to return to this pretty seaside town. 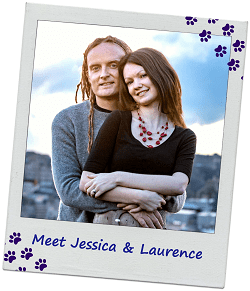 Have a question about our visit or have tips on what we should do on a return visit, we’d love to hear from you! What do you think of the notion of a “recycled holiday” where you buy gift items from thrift and antique shops? Hey travelcats, you’ve surely explored a nice travel place during your journey. I like the Morro Bay and the images you’ve shared of that place is stunning. Can’t wait to check out that place! The antique vinyl store and the jackfruit tacos seems promising. I’d love to go there. What a quaint trip! I love browsing vintage stores and have found a few great items for my wardrobe collection. There are items to fit all budgets, we bought almost entirely items under $20 and there are quite a few thrift stores and flea market stores. But you can also buy some really nice antiques, jewelry, and other goods if you are looking for them! I really need to explore more of California. The town looks charming, and I love the view on the water. It was a great town and the views on a good day are spectacular! I was lucky to be up at sunrise and sunset at the harbor. I have never heard of this place, that rock is beautiful – it looks like such a nice place! It is a very nice place and the rock is pretty amazing looking. There are several of these sort of rock formations in this area. What a cool way to promote local stores and supporting local businesses. I love thrifting, but I’m usually buying jewelry & clothing for myself and cute plates for food photography. I’ve never thrifted things to gift to others though. I think I’d feel to awkward doing that. I totally know what you mean about spending $500 though. I would feel strange spending that much too! Hi Adelina! Yes, recycled holidays are definitely a great way to support local business, save money, and be more environmentally friendly. I understand what you mean that it could feel weird for some people to gift items from an antique store or thrift store, but we have not had any issues with this. In fact some people have expressed appreciation for it (being environmentally friendly). I think it is getting over that social notion that you must go to a store and buy a brand new thing for everyone on your shopping list, although I don’t think this works as well for certain types of gifts. What a lovely place,! I think it would be worth visiting just for the amazing views of Morro Rock under the bay. I’m sure shopping must be fun but I agree with you, after having spent most of my life being thrifty it would be difficult to get non-essential stuff! I love vegan restaurants but my husband Nick hates them, so I think this one would be a great compromise. Thanks for sharing! Hmmm, you’ve managed to find a part of the country I’m not familiar with. It seems like an interesting spot to spend a day or two. I typically do most of my shopping at thrift stores so I love the idea of a recycled holiday. 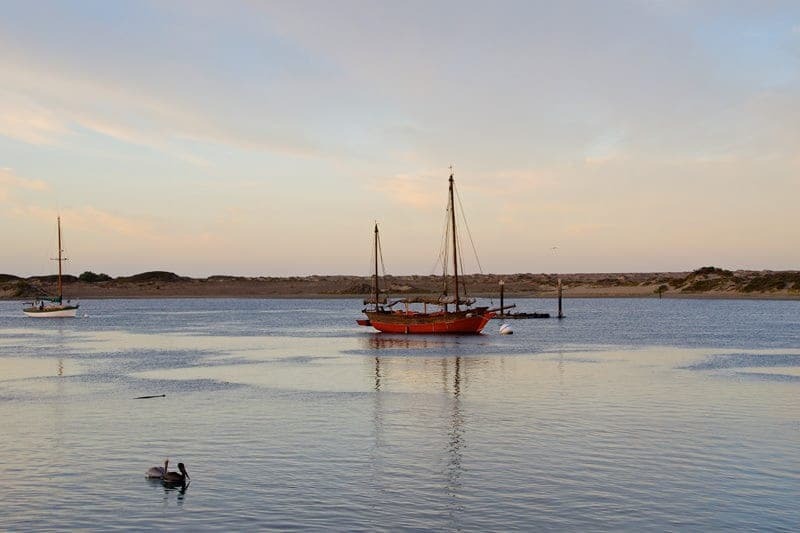 Morro Bay and the Central Coast of California in general is a great place to visit. I’ve spent many long weekends along the Central Coast. A recycled holiday sounds like a very good fit for someone who likes to shop in thrift stores! 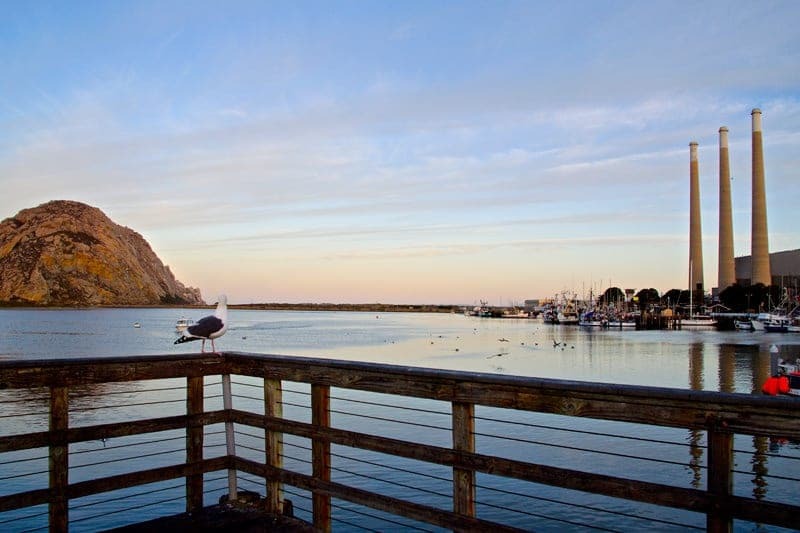 Morro Bay is a great weekend getaway town if you are traveling along California’s Central Coast. Very scenic. It is really amazing what you can find in antique stores and thrift stores. We founds lots of interesting things for both ourselves and to give as gifts. What a fun way to spend the day! And not having to spend a dime of your own money! I know you said you were initially wary of the vegan restaurant, but I’m glad you stopped and that you enjoyed the food! I’m not vegetarian or vegan but do so enjoy those options (and tend to cook that way a lot)! Hi Yalanda, yes it was interesting to go to an all-vegan cafe, the food was really yummy! 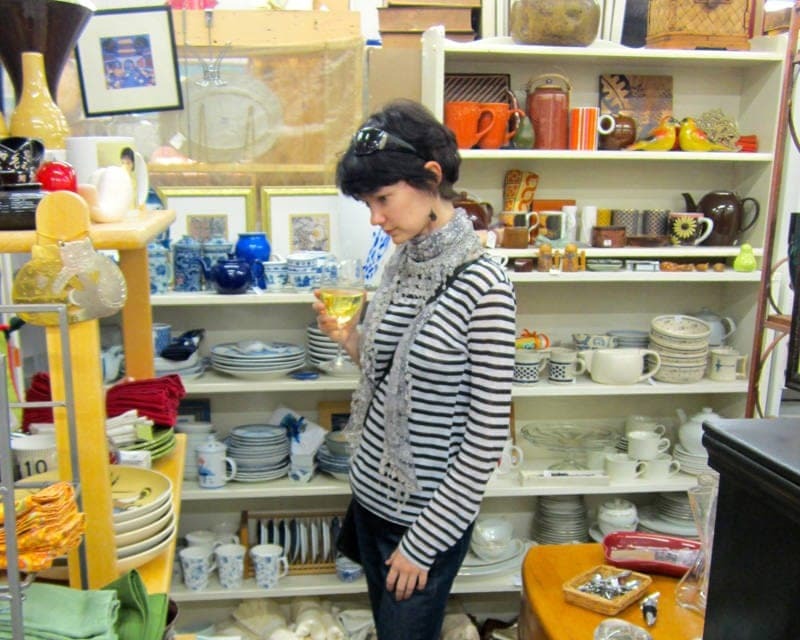 Wandering antique stores and second-hand shops is one of my husband’s and my favorite dates! 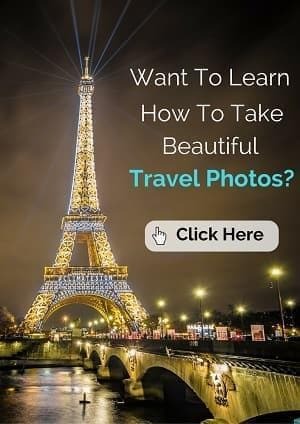 I think it’s a great idea to make a trip out of it!